A few days ago you got a sneak peek at some of the DIY decor and gifts I was working on last week for a friend’s baby shower. It’s not a Swedish tradition to have a baby shower before the baby is born (they think it is bad luck to celebrate before a birth), so we do our best to keep our American tradition alive among our friends – and we typically get lots of compliments from our Swedish guests as well. We had a lovely day and I think my projects were a success. Because we can’t buy baby shower decorations in the stores, there is no choice but to DIY-it. But honestly, I’d have it no other way. Here’s what it looked like. I found the shutter in a junk pile drive-by on the day that I went thrifting in support of Mr. Goodwill Hunting’s ‘I >3 Thrifting’ event in July. I cleaned her up and chose a fabulous blue color that reminds me of doors and window frames around Paris. I used it for the baby shower, but it is going to be a permanent installment in my daughter’s room – so more on that project coming soon. 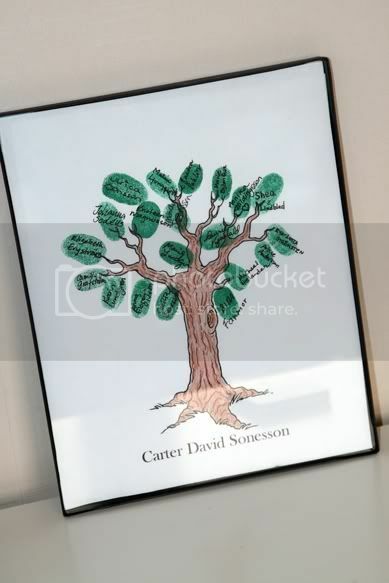 It’s hard to see in the photo because of the reflections on the glass frames, but I had such luck that the baby’s name was Carter and he is going to be the 3rd baby – thus the idea for ABC-123. 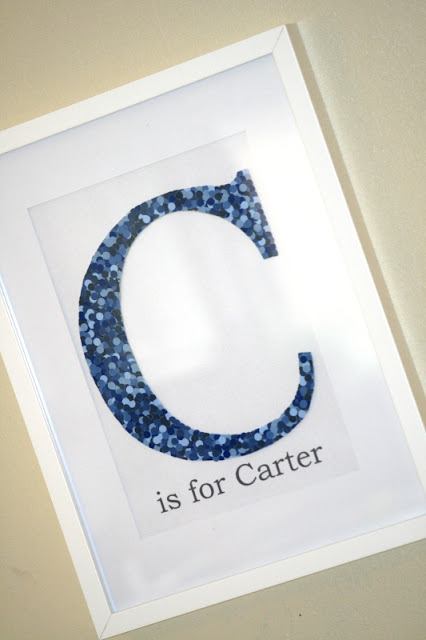 The C is highlighted and says ‘C is for Carter’, and the 3 is highlighted and says ‘3 is a magic number’. Printed them off my printer with the background scanned from a traditional Swedish children’s rhymes and songs book. Here’s another look at them before I tied them to the shutter. Mom-to-be-D liked them so much that I left them for her to hang in the baby’s nursery. Even though I absolutely love the results of this next project, I found myself thinking half-way through, “What in the world am I doing?” This C is made from hundreds of single hole-punched dots from a paint chip card with five different shades of blue. Then, each dot was glued one-by-one (you can’t just toss them on or you’ll get the white backside on there as well – and that wasn’t what I wanted for this project). Hours! It took hours to complete. Got the idea from Ally at Cut Out and Keep. 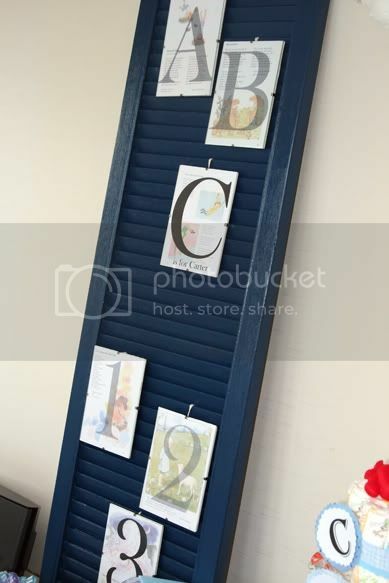 And although it was a gift, it also served double-duty as baby shower decor. 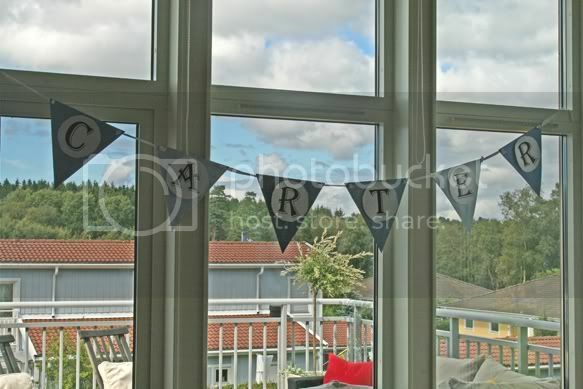 I also made a reusable banner – the baby-to-be is a boy and we had the name, so it was fun to include that in the party decorations. I’ll also post soon about what I did with this banner to make it reusable (for someone other than a child named Carter). 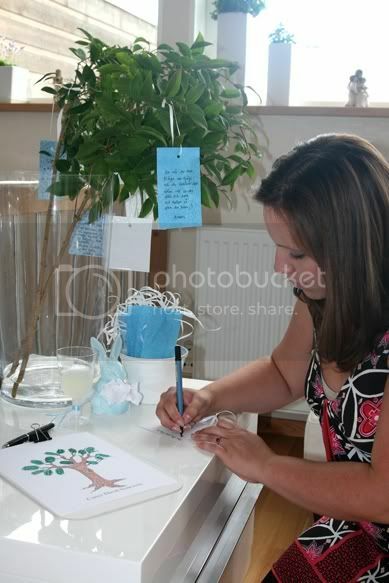 Took the idea of the fingerprint trees being used as wedding guest books and used it for our baby shower guest book. 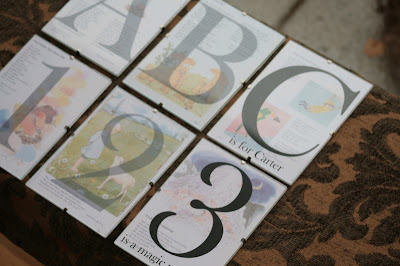 Our mom-to-be-D then received it in a frame (at the end of the shower) as a simple wall hanging for the baby nursery. 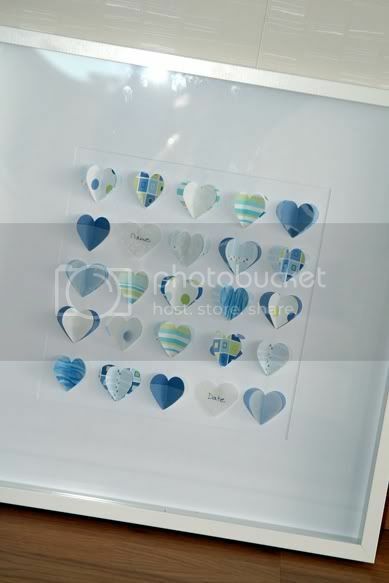 We also had a ‘tips and advice’ tree where guests could leave notes for mom-to-be-D.
A friend and I had decided months ago that we were going to try our hand at this next wall hanging that we’d seen on the popular English handmade market website, Not on the High Street. We used a simple heart punch, various scrapbook pages in shades of blue, and our best design layout capabilities. One space is left for the baby’s name, and another is for the date of birth. It turned out fabulous and several of the guests were even interested in making their own versions for various other types of events. We had a great day, the DIY decor gave us the feeling of a real American baby shower, and most importantly, our guest of honor was happy. Best of luck for mom-to-be-D for a quick labor and delivery! Such a nice ideas i appreceate your creativity. You are so artistic.The fingerprint tree is brilliantly unique. I love the little hearts as well, they're so adorable! Beautiful ideas! I especially love the fingerprint tree! Those little hearts are my favorites! 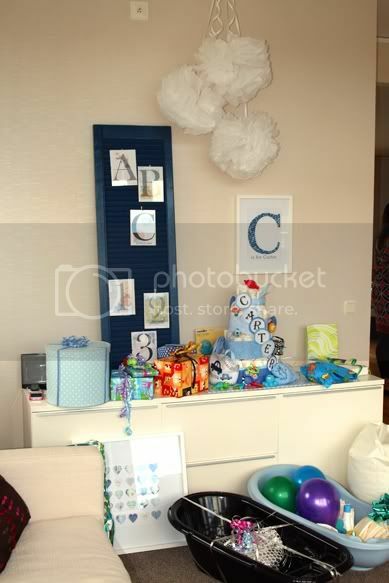 Nice gifts for baby shower, i like the blue bathing tab.